Well, ok, the boys have been in town for several days, but yesterday was the first day of the winter caravan that allowed me to catch up to them on a snowy traffic-halting day. 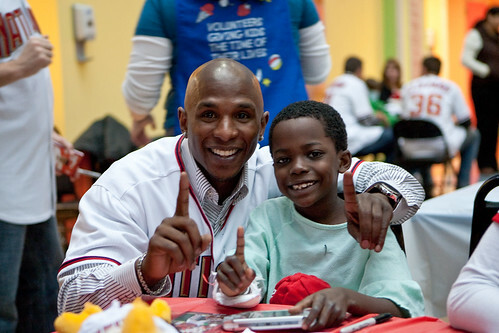 The first stop on the day’s caravan tour was Children’s National Medical Center in DC. What I love most about these types of community relations events is capturing the genuine smiles and joy expressed not only on the players’ faces, but the children whose day is brightened because of the visit. While doctors and nurses can heal the body, visits with their sports heroes sooth and help heal children’s souls, not to mention provide memories to last a lifetime. A large contingent of Nationals strode into the Atrium of the hospital where children from babies to teens, relatives and attending care providers sat at brightly covered tables ready for the attention lavished upon them. In addition to players Tyler Clippard, Craig Stammen, John Lannan, Ryan Zimmerman, Josh Willingham, Adam Dunn and Nyjer Morgan were new Nationals Matt Capps, Brian Bruney and Jason Marquis as well as manager Jim Riggleman and tv broadcaster Rob Dibble. Nats owner Mark Lerner was also on hand chatting with Dr. Fran Cogen who heads the Diabetes Program and the Diabetes Care Complex which is an integral part of the Washington Nationals Dream Foundation’s mission. Quite the entourage! I think that may be the largest I’ve seen yet. In addition to the usual conversation, smiles, posing for photographs and handing out of autographed cards, Nationals played card games of UNO with patients and autographed stuffed Screeches. A little boy who had been there five days and was going home was treated to Nats autographs on his ‘autograph pillow’ normally signed by nurses and doctors upon discharge. The little boy pictured above will be able to show all his friends the proper technique to the fist bump-finger splaying move taught to him by Nyjer Morgan aka Tony Plush! The Nationals’ visit provided a few hours where the IVs, tubes and medical monitoring equipment present in the room were forgotten or went unnoticed, replaced with abundant grins, coloring and memory making . This entry was posted on Sunday, January 31st, 2010 at 10:31 am and is filed under Community, Events, MLB, Photography, Washington Nationals. You can follow any responses to this entry through the RSS 2.0 feed. Both comments and pings are currently closed.